1. I love capturing such emotionally full days - this goes without saying and is absolutely cliche but I love, love. I know showing up for the wedding day that everyone is there to have an amazing time, listens to instruction well (no toddler tantrums here) and are feeling their best. 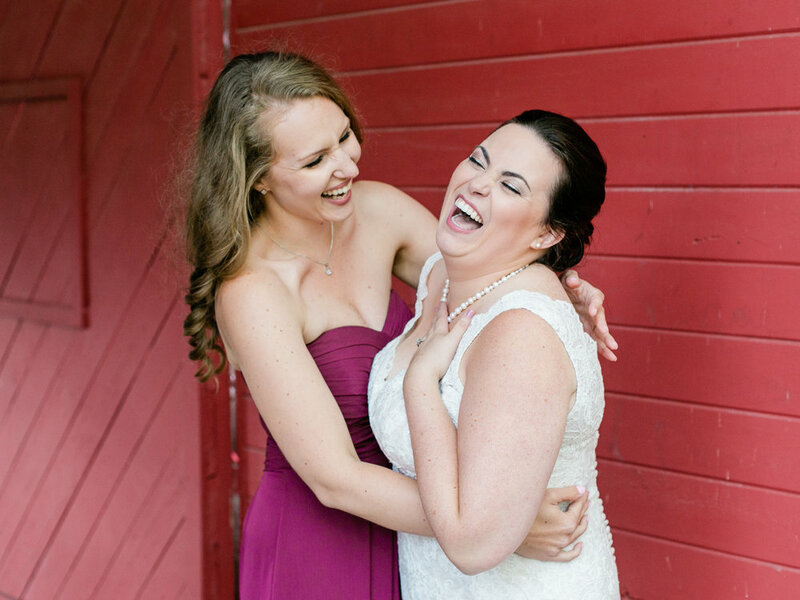 Sharing in some laughter with the bride during wedding party portraits - the in between moments are the best! 2. A well-rounded team makes an incredibly easy (and fun) day - I have the opportunity to work with some wedding industry professions a lot throughout the season and when I get the vendor list from the couple and it’s shows certain people on there - I know the day is going to go off without any hiccups. If you are looking for venue or vendor’s we love, check them out here. 3. My clients - sometimes I think this goes without saying but I genuinely am really excited for the couples we work with for their big day. We don’t accept every inquiry that comes our way because we want to make sure that we are a good fit, they understand our style and align with what we love about weddings. We really do try to stay true to our core values of capturing honest emotions during wedding days while having fun. We want our couples to look back on their wedding day and see the real moments and think back to how they had a good time with our team versus “this is the pose our photographer made us do”. I mean, common - that’s no fun right? We are an easy going team that loves our playful and laid back couples! The lifelong friendships that develop are another client fave. We remain friends even after the wedding has come and gone. Even if it’s just social media, we love seeing couples start their families, go on adventurous vacations and receive job promotions. There is a special bond that is created throughout the wedding process and I love that we are able to take that further after the wedding is done. Cheering on our couples as they grow throughout their marriage is a wonderful feeling. 4. Support - Industry professionals understand and acknowledge that the hours we work are demanding and constant. We are not in an industry where our work stays at work. We are in a creative industry and passionate about what we offer to our clients. We miss out on most weekend and evening events with friends and family so that we can be there to capture our clients most treasured memories. Industry friends understand that it’s more realistic to meet up on a Monday than plan a get together on a Saturday. I cannot count the number of times I’ve said, “sorry, I can’t make it. I have a wedding” but such is life. We continue to miss out on personal events because we are so proud and excited to be doing what we are doing. I wouldn’t have it any other way and am thankful for “seasonal” friends that just get it. 5. Details - Wedding days are busy. There are a lot of “mini” events that happen in the grande scheme of a wedding day. While our primary focus is capturing the day as it unfolds, the details play a large role in why we love this industry. Often times a bride will spend countless hours putting together the perfect decor to set the mood of how she wants her wedding day to feel. These details are what sets that tone. I’m a stickler for details and love seeing them in your wedding day album. What do you love about your industry that keeps you pushing yourself through the busy days and hard work? We’d love to know!